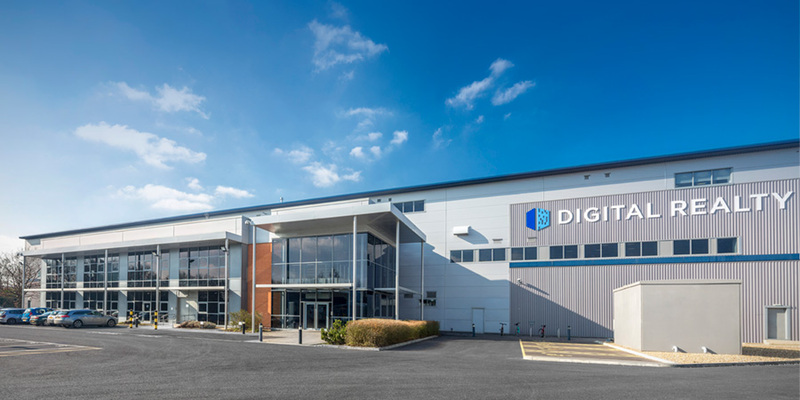 This Digital Realty Trust (DRT) data centre near Woking, Surrey, is hugely impressive. It offers 200,000 sq ft of net technical space and a further 60,000 sq ft of on-site offices. The site is supported by two diverse 80MVA power feeds, so quality is high, as is site security. Indeed, we believe it is one of the most secure data centre facilities in the UK. Retail colocation space, either as individual cabinets or caged space, is available. Ask us for options on either part racks or individual racks, which come with 4kW as standard. Small dedicated caged space is also possible. Sentrum acquired this former distribution centre near Woking in October 2007, and the first data centre clients went live in April 2009. It was Sentrum’s fourth facility. Sentrum in turn were acquired by Digital Realty Trust in 2012, who continued the wholesale model that remains the main focus for this site. DRT will build the private suites within the building to each client’s specific needs. A general standard will be to Tier 3 at 1.5kW/sq m for 5,000 sq ft upwards on a long-term leasehold basis. However, retail colocation such as full racks and part racks are available. Known tenants include DR specialist Sungard, Telstra and Adapt. Other clients include financial institutions and some government organisations.